Give 'em two of their favorites—mac and cheese and cheeseburgers with the works—all in one 30-minute dish. Brown meat in large skillet; drain. Add water, milk and ketchup; mix well. Bring to boil. Stir in Shell Macaroni; return to boil. Cover; simmer on medium-low heat 10 min. or until macaroni is tender. Stir in Cheese Sauce, tomatoes and onions; cook until heated through, stirring occasionally. Serve with a crisp mixed green salad tossed with your favorite KRAFT Dressing. 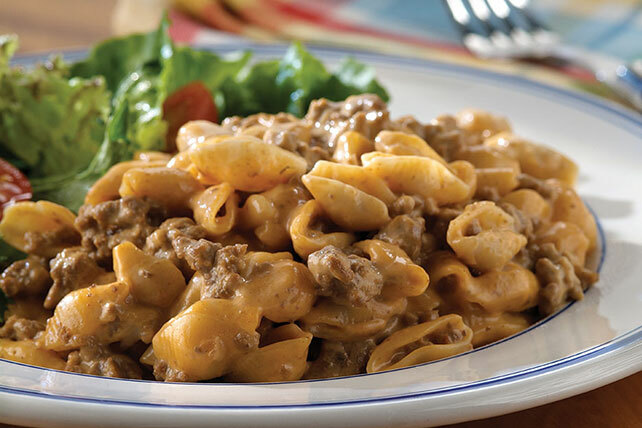 Prepare using your favorite lean cut of ground beef, such as ground round or ground sirloin. Substitute 2 cups frozen BOCA Ground Crumbles for the browned ground beef.